Behold my first pair of socks 2008. 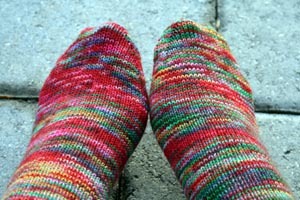 The yarn is Sophie’s Toes and the color is called “Christmas Lights” and that’s just what they look like to me. Of course, the real Christmas Lights are all put away for the year but these socks will be a sweet reminder of the season until it comes around again. Nice – those are very christmasy. Ooooh, those will brighten up a gray winter day!! And it’s supposed to rain later today so those will be nice to gaze at. Pretty! Appropriately named socks, indeed! 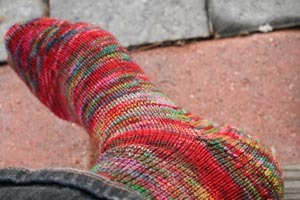 Verra cheerful socks! I’ll be doggone if those don’t look EXACTLY like Christmas lights! Nice! Indeed they do look like Christmas lights! Pretty! Carole, those really are festive! I like the little glimmer of color that peeks through. Nice colorway. Fun socks. You’re keeping Christmas in your heart and on your feet all year long! Love ’em! They are very cheerful! Enjoy! Fabulous! These must have been so much fun to knit! What a perfect name for that colorway! Love ’em! I can’t believe you already have a new pair of socks and it’s only January 10. Bright, cheery and beautiful! It must have been fun to watch the colors come together as you knit them. You have been a knitting machine my friend! I love the colors…very festive indeed! Perfect for a grey winter day! And you know, when you think about the colour, they would even be perfect for Cinco de Mayo. When do you sleep?? They are very festive! 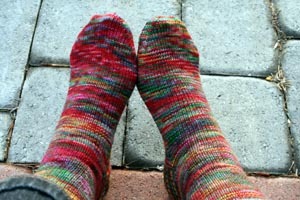 Oooh, the girls were just singing the praises of Sophie’s Toes yarn this weekend! Your socks are so pretty, I’ll have to check out her stuff. 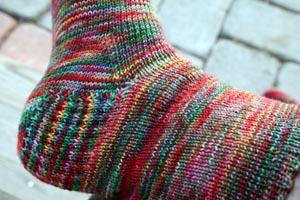 very cool yarn; i have yet to even START a new sock in 2008! Love the bright, happy colors, and the slightly pointilist way they all play together — not quite stripes, but not quite dots, either. Adorable! Those pictures are making me very very happy! Love the picot edge too. Cool socks! How did you get a pair done already? It’s only the 9th??? You are quick!!! Perfect name for the yarn! Those are fabulous! Well done. Pretty and cheerful socks you have there. And look at you, having a finished object already. Those *do* look like Christmas lights. How pretty! Christmas lights, indeed! They’re lovely. 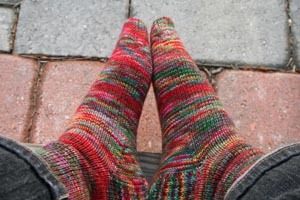 just saw these on Ravelry and i love that yarn. they look great! You know, I am not normally a big fan of gaudy colors, especially a lot of them in the same skein of yarn. But those socks… yum. Nice and bright. And they are good for Valentine’s Day as well because there is a lot of red in them. I can see your toes smiling all the way in Wisconsin! Those are some fun socks! And a beauty of a scarf in the previous post…aren’t you a busy knitter these days? Ooooh! Me likely a lot!! Oh yes, those colours make me happy as Christmas lights! I love that colorway. Cute socks!! Those do look festive! Now I can’t start mine ’cause I have 6 socks going. 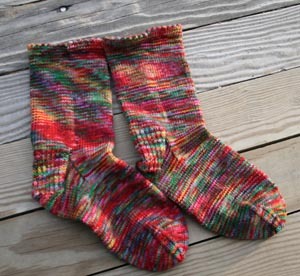 So pretty, those socks, AND that yarn! I’ve never heard of it, and I see she’s sold quite a bit through her etsy site. I’ll have to keep my eye out to see if she offers that colorway again.